The new 2019 learning and teaching resources from the Church are not just updated manuals—they are part of a new home-centered approach to learning and living the gospel. Before January, each LDS household will receive a copy of Come, Follow Me—For Individuals and Families. Here you will find helpful ideas to support personal scripture study, family scripture study, and home evening. If you haven’t studied the scriptures regularly in the past, this resource can help you get started; if you already have a good habit of scripture study, this resource can help you have more meaningful experiences. The resource will be available in the Gospel Library app, online, and as a printed manual. In 2019, resources for teachers to use in Sunday classes will be adapted to align with this new home study. 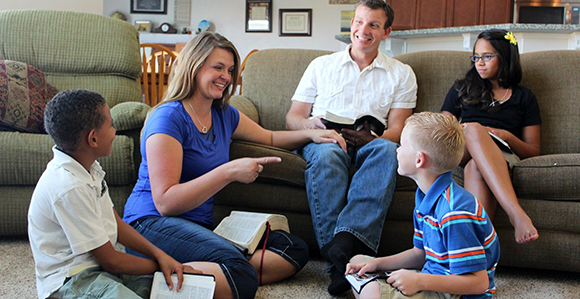 Learn more in the article “A sneak peek at the ‘home centered’ Church curriculum for 2019” and watch more videos at ComeFollowMe.lds.org. Larry, thanks for this announcement and it leads me to a question that has been being spoken of for a while. Is this going to take the place of Sunday School for families to teach at home, which will shorten the 3 hour Sunday block to two hour blocks on Sunday? This just may be rumor mill generated but seems logical to think that it gets back to instruction in the home, that takes the place of 1 of the hours at Church. Thoughts? Boy, the rumors really are flying lately, aren’t they? Just consider them all rumors. Anything that is official will be announced in the appropriate ways by the Brethren in the right time and in the right way. We could have put another one or two words at least in a building with a shorter schedule. That would save us building so many buildings. Come, Follow Me is not new. It has been used in the youth programs for some time. Its just a more structured way of teaching with a choice of topics and it is correlated in all youth classes. Youth Sunday School (2nd hr) and separate Aaronic PH/YW (3rd hr) classes all use it. My understanding is that this is just being expanded to the adults and Primary areas as well. So if you look at any of the 3 Youth Come, Follow Me manuals on Gospel Library, that will now be used everywhere. I think the 2 hr block is just rumour. I have been hearing this 2-hour block rumor as well. At my age I could write volumes on all the rumors I’ve heard at church; some of them quite interesting. I will be listening attentively the weekend of General Conference to hear what’s actually going to be happening. That would be great to only have a 2 hr meeting! Think of how more wards could meet and use one facility and save on constructing of buildings. Give parents that opportunity to go home and teach their children. There might be Less Cranky kids and missed naps..